MISSION, KS--(Marketwired - Nov 7, 2013) - (Family Features) Today, less than half of American families eat dinner together every day (Source: National Survey of Children's Health 2011/2012). One secret to dinner on busy weeknights is keeping the ingredients for your favorite meals within easy reach. Keep your freezer organized for quick meal planning. Buy extra frozen or fresh poultry, beef and pork when they go on sale. If fresh, freeze them in family dinner portions. Then, stock up on pre-cut vegetables, like Birds Eye's new Recipe Ready line of pre-cut, sliced and diced vegetable varieties that help complete a meal. Spend less time searching for recipes. Pick one day a week to sketch out a menu filled with fast and easy home-cooked family favorites. It's easier to save time during the week if you already have a plan. With more than 20 varieties, Recipe Ready vegetables have recipes right on the package for everyone's favorites, such as stir-fries, fajitas, tacos, chicken and pasta, hamburgers and more. Take advantage of cooking short cuts. Using pre-cut, high quality vegetable varieties not only saves money on wasted produce, but also on shopping and prep time without sacrificing the quality and taste of the meal. Plus, since the ingredients are already chopped, the only thing you have to open is the bag. Goodbye cutting board, hello Recipe Ready! Enlist helpers. Having the kids help with some of the cooking makes the process more fun, plus kids are more likely to eat what they create. Have kids mix ingredients, top dishes with garnishes and help put dinner on the table. "At Birds Eye, we're dedicated to creating simple solutions for dinnertime," said Birds Eye Chef Michael Christiansen. "Recipe Ready helps families save time during the dinner hour by cutting out the washing, slicing and dicing of vegetables." 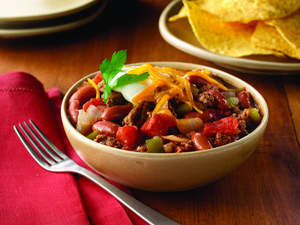 Chef Christiansen continues, "One of my favorite dishes to make during the colder months is Easiest Ever Chili using Recipe Ready Chopped Green Peppers & Onions -- it's hearty, delicious and perfect for chilly weather. My family loves it, including the kids because they get to help out adding the veggies to the skillet and topping the dish with sour cream before digging in." Recipe Ready vegetables provide a nutritious and time-saving solution for busy families. Fill your freezer with all the varieties to ensure delightful meals every night of the week. Find more recipes and ideas at www.birdseye.com/recipeready. Brown ground beef with Recipe Ready Chopped Green Peppers & Onions in medium saucepot. Add remaining ingredients and simmer uncovered, 20 minutes. Serve, if desired, with reduced-fat shredded cheddar cheese and light sour cream.